All radio programs offered here do not appear to be in current circulation or are harder to obtain. I am gradually digitizing my long time collection on reel tapes and will occasionally offer new downloads from time to time. 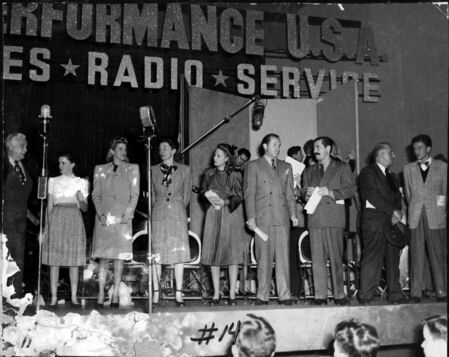 Command Performance was a radio program that ran from 1942 through 1949 produced by the Armed Forces Radio Service using a direct shortwave transmission to the soldiers and military personnel overseas during that time. The program was not available on U.S. broadcast stations because it was designed for those troops "over there." Recently, I discovered a not very good copy of an episode that is not in general circulation. The only place I have found it listed as available was on Jerry Haendiges site, though he says it is in his collection, but not available. I had an email exchange with Jerry and he indicated he had the file and kindly provided me with a much better copy! So if you are interested in hearing this episode then feel free to download this copy. It features Frances Langford as host with Mel Tormé and the Meltones and Ella Mae Morse. A big thanks to Jerry for the better copy! Material in this web page, copyright © 2013 James F. Widner.